Textile protective coating is formulated to stop stains without using dangerous off gassing which is common in this type of product. Our advanced plasticization process is undetectable to sight, smell and feel. Many different textiles are used in building today’s RV interiors, VC-2 strengthens these materials increasing their life by up to 60% guaranteed for 5 years. 5 Year, Repair or Replace Guarantee! Q: Is VC-2 safe for kids and pets?Yes, VC-2 is formulated for use in the tight spaces of your RV. We use a process called “plasticization” that dries and bonds to your textiles creating a undetectable safe barrier. 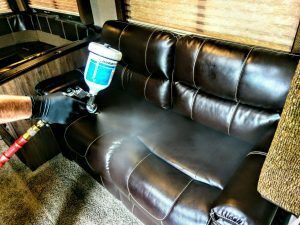 This same type of treatment protects materials used in medial applications with no “off gassing,” it’s safe for kids, pets and the hyper allergenic. Q: Do you just use VC-2 on my carpets and chairs?No, Duratain® treats all textiles used in your RV. This would include items like, day/night blinds, valences, head liners, wall panels, carpets, furniture and upholstered bedding. Q: What do you warranty against?We guarantee, accidents don’t become permanent! Duratain® Warranty’s VC-2 will stop stain damage from your textiles primary enemies, including food and drink along with pet and human wastes with a 5 year repair or replace guarantee. See warranty for details.